'Distant Horizons: Pioneers of Psychedelic Art' is a thoughtful exhibit that features mind-blowing, kaleidoscopic works. Isaac Abrams’ 1965 “Hello Dali” is one of the mind-blowing artworks in "Distant Horizon. 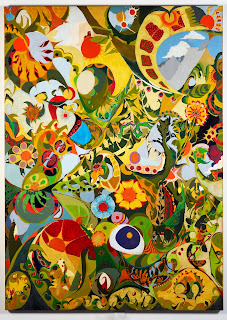 "saac Abrams, one of the four artists featured in the Distant Horizons: Pioneers of Psychedelic Art exhibit opening Friday at Carl Solway Gallery, well remembers when he tried the hallucinogenic drug LSD. It was 1965 and he had already taken the mind-altering substances psilocybin and mescaline. But acid, as LSD was called, was stronger — it caused a radical heightening of consciousness. “I came away with the idea that the experience was profound and had to generate an artistic response,” he says. So he started a gallery devoted to Psychedelic art, Manhattan’s Coda. He found few if any artists creating the kind of work he liked, and eventually cash ran short. “So I traded for a large canvas, 5-by-7 foot, and some small canvases and I spent a short time learning how to mix paint and which brushes to use and I embarked on my first serious painting,” he says. That work, 1965’s “Hello Dali,” is the largest of 10 paintings that Abrams has in this thoughtful show, which also features Psychedelic work by the artist collective USCO (particularly Gerd Stern), Tony Martin and Ira Cohen. (There are also films.) “Hello Dali” is, fittingly, mind-blowing — as if a kaleidoscopic camera had been installed in your brain to beautifully scramble your vision of a landscape into ornamented, segmented fragments of green, blue, yellow, red and every other color in the mind’s eye. In fact, the mind’s eye is there, itself, on the canvas, as if floating through doors of perception. “Hello Dali” comes to the Solway Gallery — as does some other artwork in Distant Horizons — straight from a traveling museum exhibit, Hippie Modernism: The Struggle for Utopia. That show has been hailed for taking seriously an art movement of the mid-to-late 1960s that is considered today more of a fleeting cultural trend, if it’s considered at all. Hippie Modernism’s artists and message appealed to Michael Solway, director of the gallery his father established. Growing up in Cincinnati in that era, he loved Psychedelic art and music — his father had a show of the music poster and underground comics artist Victor Moscoso in 1973. 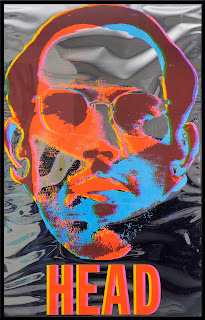 He also liked the musicians favored by the late Ira Cohen, who took woozy, distorted color photographs of them and others reflected on the surface of Mylar. In this show, Cohen’s 1968 “Jimi Hendrix” is a fitting portrait of the Rock star whose “Are You Experienced?” song is one of Psychedelic Rock’s greatest. Artist Tony Martin — who shows oil paintings, posters, drawings, ephemera and more in this exhibit — says he was never deeply into acid. In the 1960s, he created “paintings in time” — multi-projector visual presentations involving light, liquid and dry ingredients, abstract hand-painted slides and some realistic imagery — for New Music composers at the San Francisco Tape Music Center. He went on to do light shows at San Francisco Rock ballrooms. He also has made innovative sculptural installations like 1968’s “You Me We,” in Distant Horizons, which merges the images of two people looking into custom-made two-way mirrors. DISTANT HORIZONS: PIONEERS OF PSYCHEDELIC ART opens Friday with a 5-8 p.m. reception at Carl Solway Gallery (424 Findlay St., West End). The artists and guest curator Carlo McCormick will have a panel discussion at 12:30 p.m. Saturday, followed by a poetry reading by Gerd Stern. The show is up through Sept. 16. More info: solwaygallery.com. Two copies of a poster for 'Head,' a 1968 movie starring The Monkees — so often derided as the ultimate in fake, commercial boy bands — are displayed in 'Distant Horizons: Pioneers of Psychedelic Art' at Carl Solway Gallery. Distant Horizons: Pioneers of Psychedelic Art, the exhibit currently at the Carl Solway Gallery, is a show devoted to 1960s art at its most radically transformative. The four principal artists — Isaac Abrams, Ira Cohen, Tony Martin and the artist collective USCO (especially its member Gerd Stern) — were, in many cases, so turned on by LSD that they sought to create work that, like the drug, could see through all of life’s pretensions and artifices to arrive at the pure white light/white heat of revelatory truth. So what are two copies of a poster for Head, a 1968 movie starring The Monkees — so often derided as the ultimate in fake, commercial boy bands — doing in this show? It’s a beautiful screen-printed poster — an image of a serious-looking, bespectacled young man’s head on reflective Mylar, with colors swirling around. It’s so memorable it’s in the collection of the Museum of Modern Art. Still… The Monkees? The explanation relates to USCO’s Stern, who at age 88 has a fascinating history as a poet, visual artist, Beatnik and hippie. There’s a 329-page interview with him, conducted by the University of California’s Regional Oral History Office, available online to prove how unusual his life has been. He, as part of USCO, was involved in a groundbreaking Long Island disco, called The World, that used new media projections so groundbreaking it received widespread press coverage. The Solway exhibition has a copy of a 1966 Life magazine featuring the place. At the time, Stern was represented by a young John Brockman — now a top literary agent — in his commercial ventures. In the limo were two men, Bob Rafelson and Bert Schneider, who had created The Monkees, a television sensation from 1966-68 in which four actors were hired to portray a zany, tight-knit Beatlesque band. By 1968, Rock music had moved on and they were seen as too synthetic and adolescent. Still, Rafelson and Schneider had parlayed their success into a six-picture production deal with Columbia Pictures. For the first film, they wanted to make the band newly appreciated for the turned-on generation. According to Stern, the two producers sent him and Brockman to Hollywood to plan for the movie’s promotional campaign. Stern says USCO’s Judi Stern and Barbara Durkee printed 100 copies of the Mylar posters. There were also paper ones. Stern kept four of the Mylar ones. Head flopped when released but has since become a cult favorite. But Rafelson’s and Schneider’s next production, the Dennis Hopper-directed Easy Rider, changed Hollywood and made actor Jack Nicholson a star. DISTANT HORIZONS: PIONEERS OF PSYCHEDELIC ART is on view through Sept. 16 at Carl Solway Gallery, 424 Findlay St., West End. More info: solwaygallery.com.